Things I would have changed: I would prefer that there not be adhesive lined inside the rings. 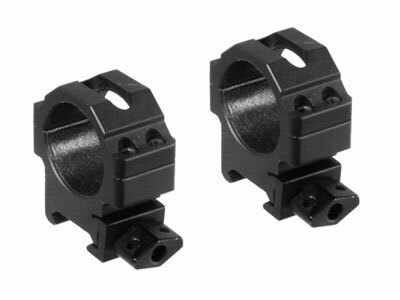 What others should know: I have several scope rings from UTG, and I feel like the twist-lock base model is the easiest to use, and they're exceptionally sturdy. You have enough space to fit your allen wrench completely through the twist knob to give you more leverage to shore up the rings to your rifle or base. The adhesive on the inside is functional, but I've had to adjust my scope an excessive amount for barrel droop, and the adhesive leaves kind of a mucky sheen behind once the scope is moved. Compared to other Leapers models in 30mm: 30mm Rings, High 3/8" Dovetail 30mm Rings, Medium, 3/8" Dovetail 30mm See-thru Rings I preferred the twist-lock base to work with the most. Things I liked: Sturdy, well made, easy to install. Things I would have changed: No comment. What others should know: Used the UTG 30mm Max Strength Rings on a high power Diana sidelever rifle. So far, after 600 shots, the rings have gripped my scope securely. The scope has not moved. Rings aligned perfectly when I mounted them. No need for lapping. Good deal for the money. Things I liked: Very heavy duty but lite at the same time. Well made product! Things I liked: Easy on off thumb screws, 4 screw caps steel mounting clamp. Things I would have changed: Make them 3.5mm lower, they sit pretty low but another 3.5mm lower would be perfect with my Barska Euro AC10010 6X42 that is mounted on my Nitro trail. What others should know: With this setup I shoot at 1/4" bulls and group 1/2" - 3/4" at 33 yards using H&N copper 8.80grns round nose. Things I liked: Well built mount. I've had no problem with them. Things I liked: Overall its is a very fine product. The scope stays in place all the time.the pellet always on target 30 yards,consistent product for that price. Things I would have changed: Make the rings little bite lighter. What others should know: Good product for air guns that have barrel drop. Paul--These rings do not have any way to adjust for barrel droop since they're not adjustable. How do these rings adjust for barrel droop? Things I liked: Solid mount. I especially like that UTG puts a kind of tape inside helping it to hold a scope from slipping without over tightening the caps. Things I would have changed: I would include some extra tape for shimming or replacement should the original tape become worn. I used these rings on several rifles during some test procedures. I am very happy with them but they looked a bit worn when one installation was too loose. The scope moved taking the tape with it.